A Christian Holiness Collection presentation. Three fascinating, action packed stories from the old holiness literature circa late 19th and early 20th centuries. 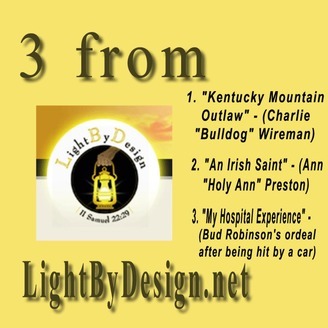 Our first story is called “Kentucky Mountain Outlaw.” Experience what the old west was really like in this autobiography of Charlie “Bulldog” Wireman. The 2nd story from this collection is called “An Irish Saint” and it is the biography of Ann Preston who was also known as “Holy Ann.” Her unbelievable story was written by Helen Bingham. Finally, Bud Robinson was a charismatic leader of the holiness movement many years ago. At one point, he was hit by a car and had to spend over 5 months in the hospital. He was not there alone. 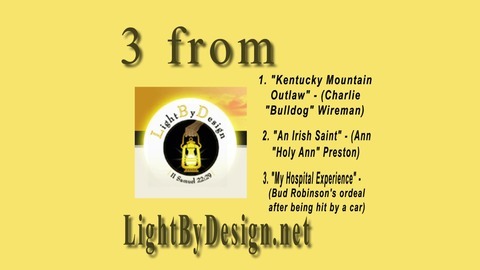 God’s Spirit resided with him as you will see as you listen to the last of this trio of stories, “My Hospital Experience” by Bud Robinson. Produced and narrated by Vic Zarley. Special thanks to LightByDesign.net, Northwest Nazarene University, and the Wesley Center online for their invaluable assistance in the production of these audiobooks. Three music tracks used in these episodes: "Hoedown" by Jason Shaw; "Folk Round" by Kevin Macleod; and "Everything Begins" by Dan-O. This is part of a special collection of Podiobooks that is rapidly growing in number. Please check out the other selections by keying in the words "Christian Holiness Collection" in the search field of Podiobooks.com.